After Saturday’s normal run, Cinder, Dec and I stayed in the Tomb of Sargareas to have a bit of an explore and see all the rooms that we normally don’t go into. 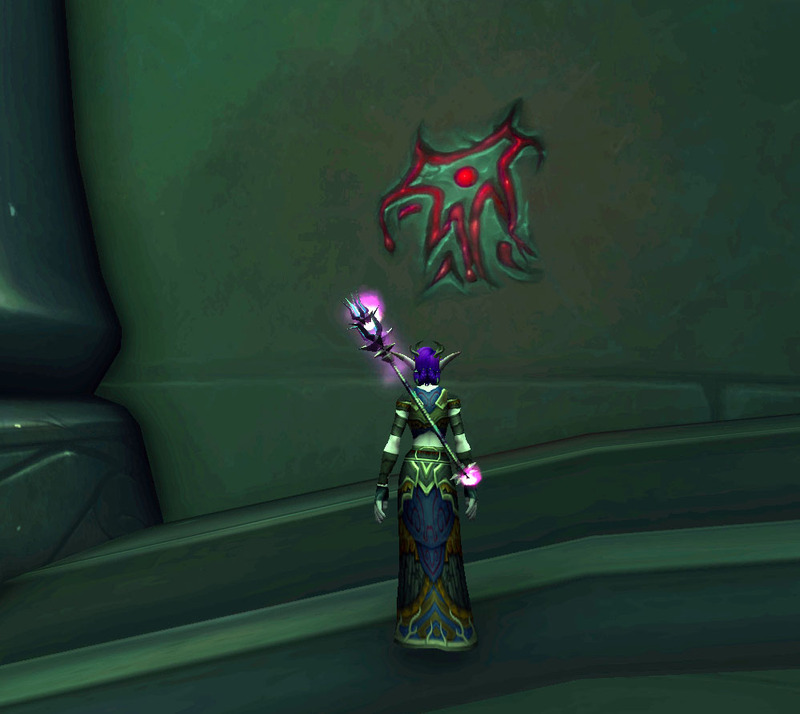 Cinder had mentioned to me earlier that there were runes around the Tomb that when clicked would let you turn into Gul’dan. I hadn’t seen them before so Cinder took me through the instance to find them. 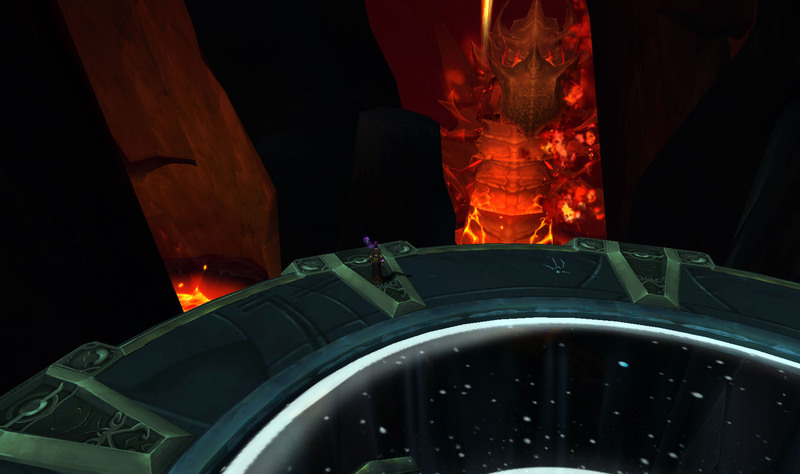 Even though we had cleared the whole instance there were still quite a few rooms that had mobs in them so it was lucky we went in as the trilogy of tank, dps and heals. Even so there were still a few deaths when we all took turns triggering the polymorph adds in different places. 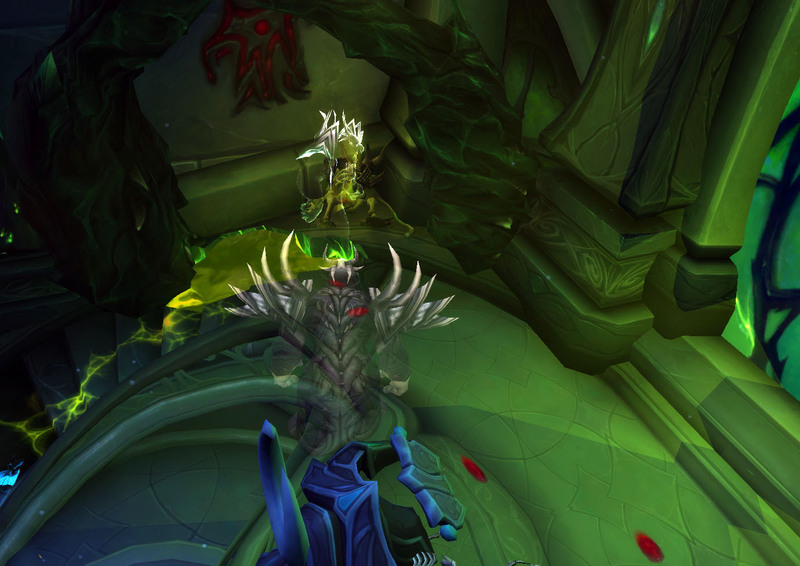 There are 5 different runes scattered through the raid. 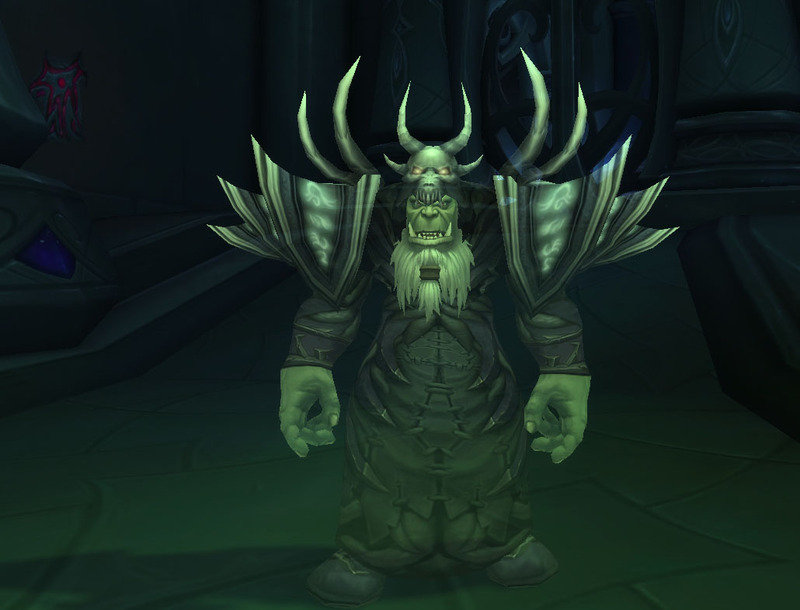 The first two I clicked on turned me into Gul’dan but didn’t do anything else. 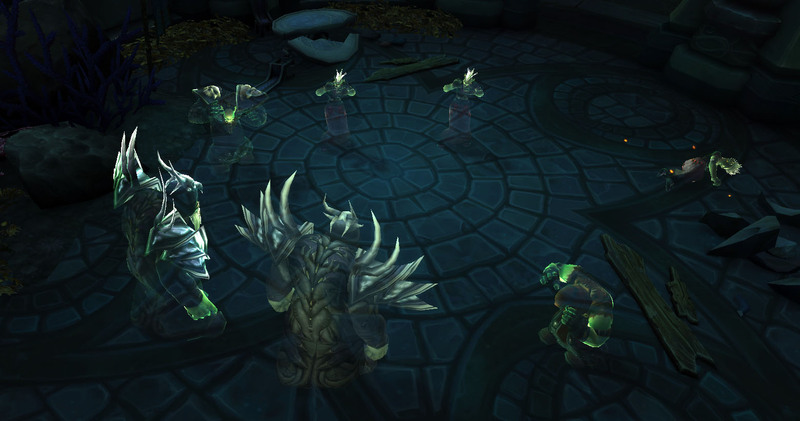 The third showed me a cutscene of Gul’dan surrounded by orcs and Gul’dan killing one, but no dialogue. I was hoping the 4th would show me another cutscene but it didn’t. While searching for the 5th rune we came across a small room that held the biggest biggest puzzle of all. On either side of a doorway were a pair of ancient switches that could be clicked on. When lit up, we could hear a grinding sound but couldn’t find any changes that the switches made, so we started to scour the area looking for a reason for those switches. I happened to have the map open while in the same room as the switches and saw that behind one of the doors that could not be opened was another room. 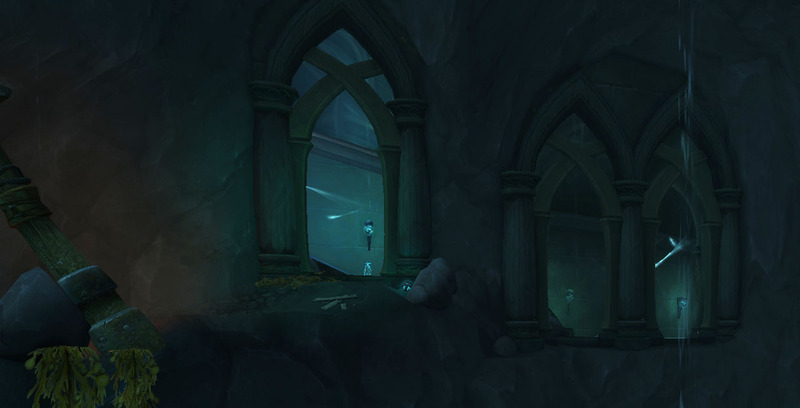 Dec used his spectral sight and it showed quite a few mobs behind the walls and door, but their location didn’t quite line up with the room according to the map, which was another mystery. Once we realized there was a whole other room hidden behind this door, we started to go room by room looking for a way to get that door open. 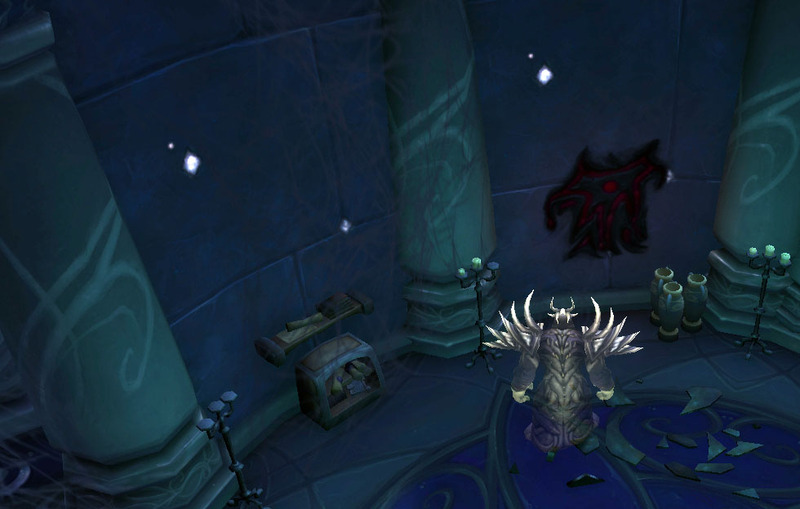 While clearing out the chapel where the spirits were still in service, we found the 5th Gul’dan rune. 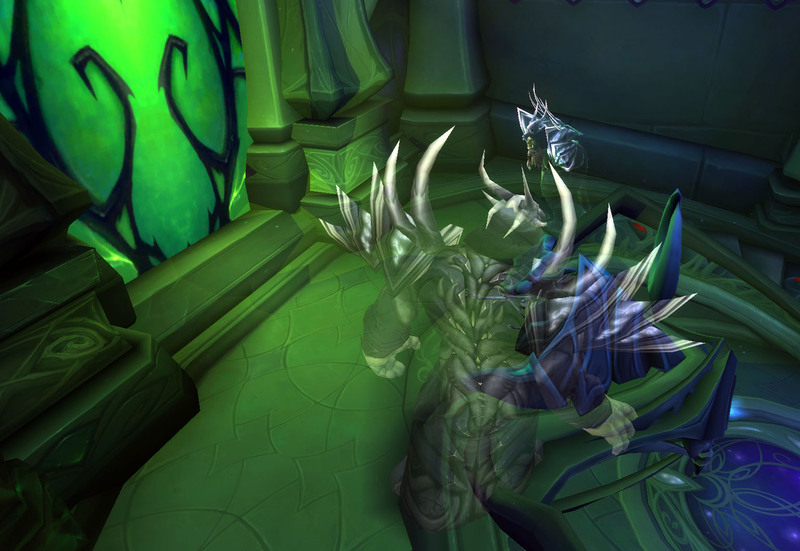 Clicking on this one gave another vision, this one showing the death of Gul’dan and his steps to his final resting place. His staff and armor still there to see. 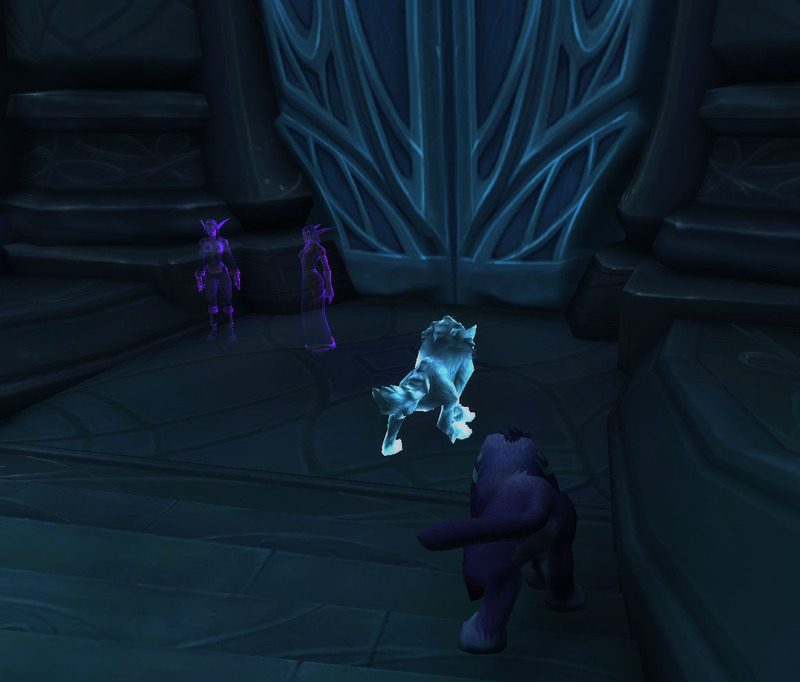 As soon as the vision faded, I raced back to the hidden room to see if clicking on the door or switches while in Gul’dan’s form made a difference, which it didn’t. So we set off back through the rest of the instance to see if we had missed something. Looking so closely through the tomb, we found a few interesting details. 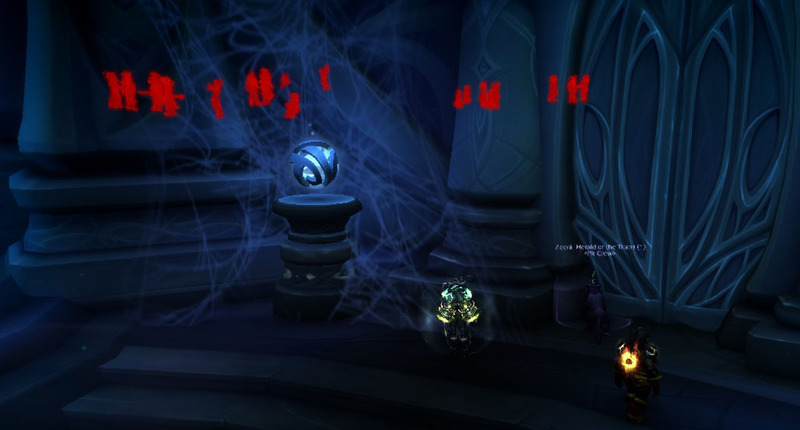 The neutral mobs that were left in the raid cycled colour from purple to white and back again. We aggro’d a couple and dragged them into the Sister’s room and found their colours matched the colours of the floor as the moon was still phasing across the floor. Interestingly enough, the mobs that are always hostile don’t cycle colours. Overlooking the Sister’s room, standing on a balcony is a NPC called Fan’verg the Vicious. 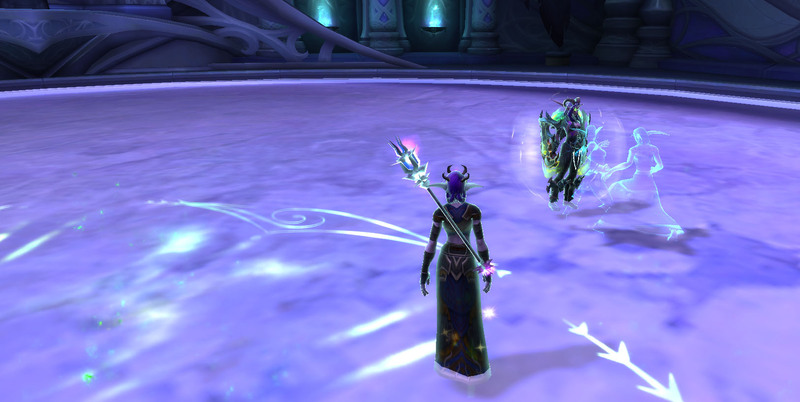 I was able to get close to her while in the Gul’dan illusion as that turned all mobs neutral to me. Without the the illusion we weren’t able to get close to her, having triggered a protective trap right in front of her. 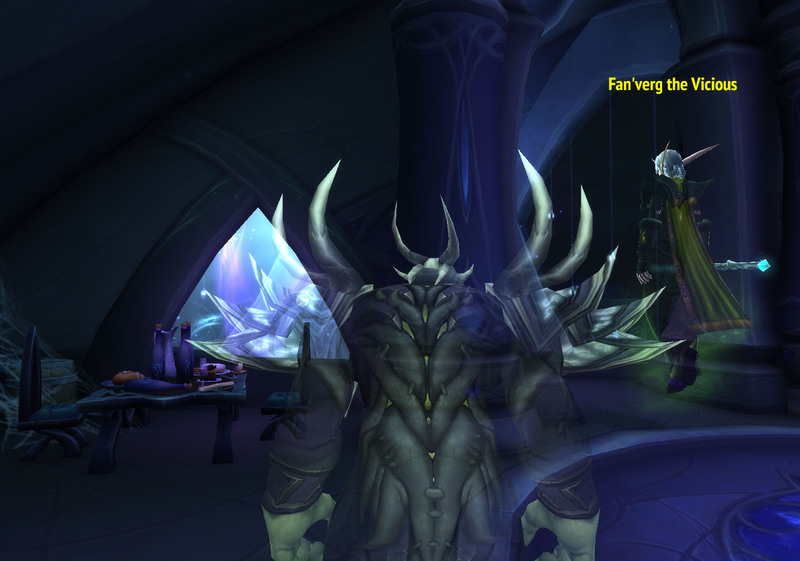 Wowhead has comments that this NPC could be a tribute to Fanny Vergne who’s a 3D artist at Blizzard. The scenery in this raid is absolutely gorgeous. On the way to Desolate Host there is a wall with stained glass images and the statues that are broken have ghostly images of what they looked like while intact. Cinder pointed out that from far away this statue looks beautiful, until you get closer and realize that her eyes have been gouged out. We worked our way from the very top of the raid right to bottom but no matter where we looked, there were just no other switches or hidden rooms so it’s remaining an utter mystery for now. 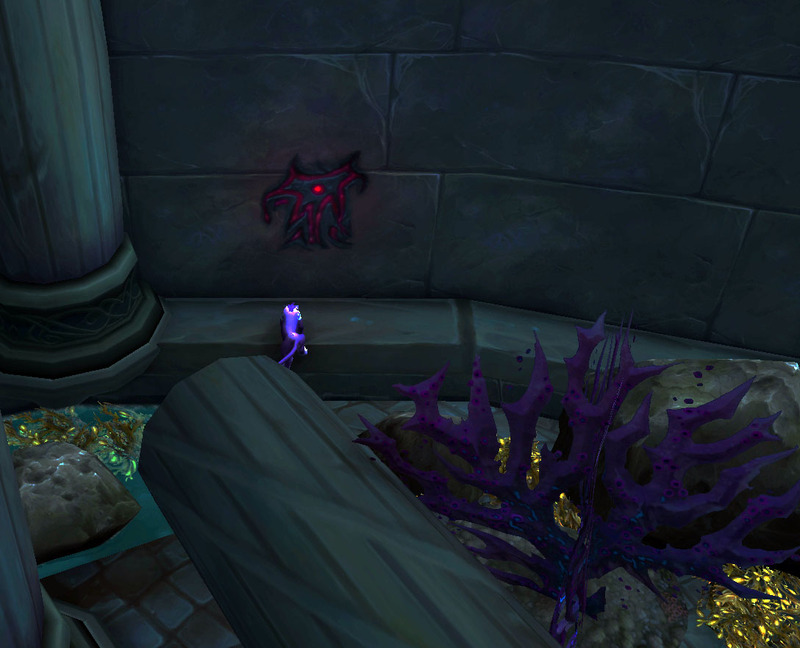 Maybe that door will open when Mythic Kil’jaden has finally been defeated. 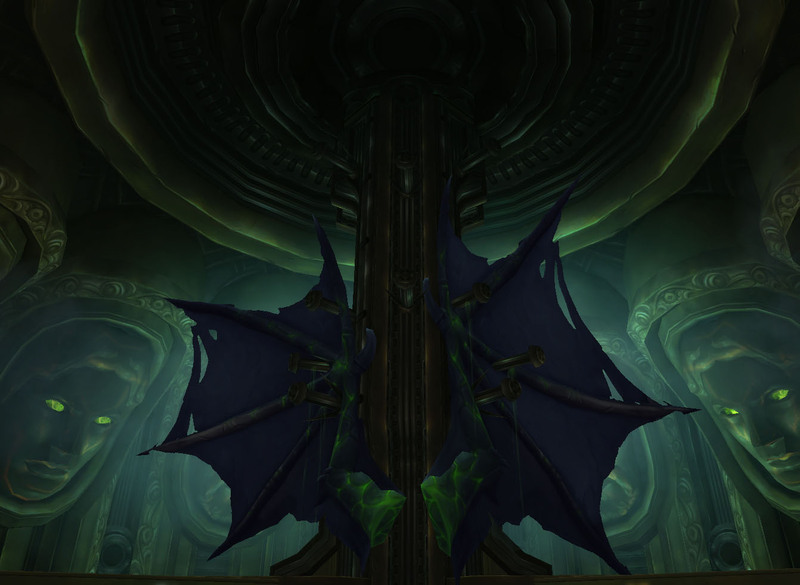 This entry was posted in General and tagged exploration, hidden rooms, tomb of sargeras by Zeirah. Bookmark the permalink. Wowzers, a Mystery Room! This is totally fun, what is behind the door: treasure, stories, certain death? 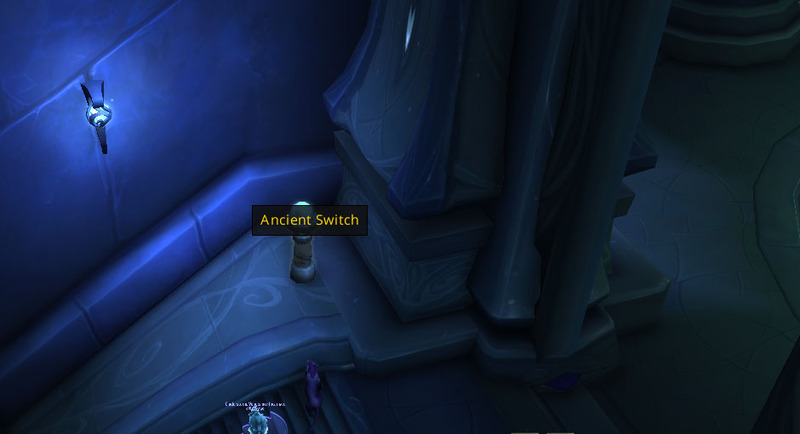 The funny “ancient” switch must be labeled by current members of the Tomb because when it was made it was “brand new” switch. What is it? We have to know! 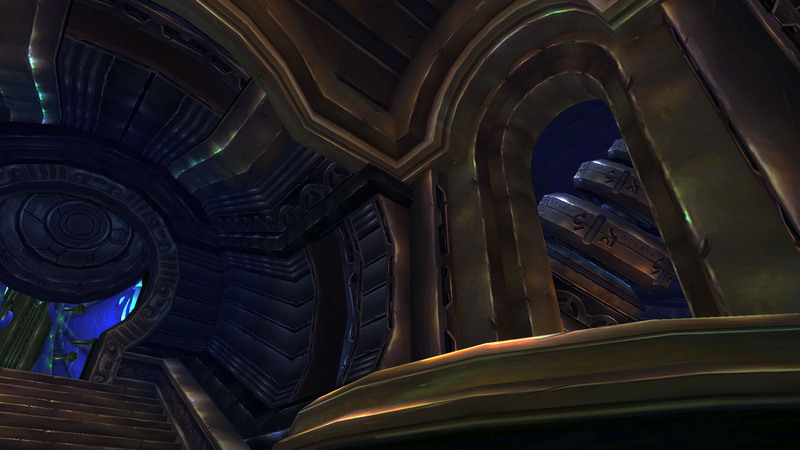 Many years ago we used to do tricky things to get behind the walls in Iron Forge. 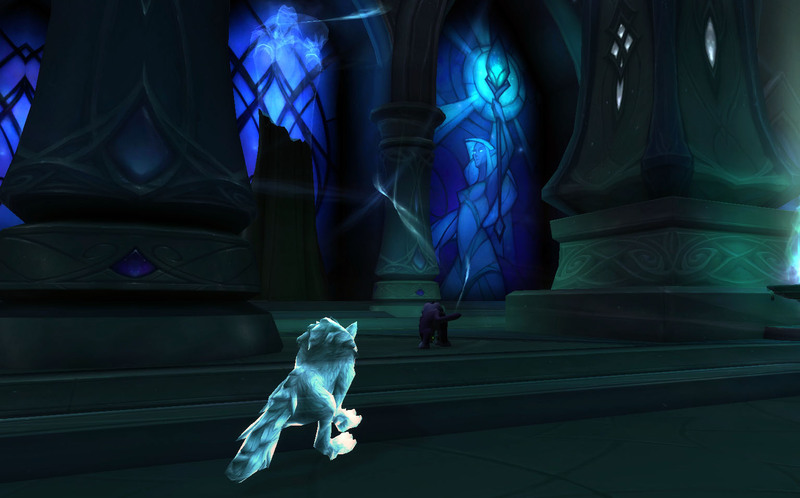 I recall that, as a hunter, I could rez my hunter pet right next to a spot (the rez would be on the other side of the wall) and then use Eyes of the Beast to go exploring. I wonder if we could do those tricks today … and get behind that door! 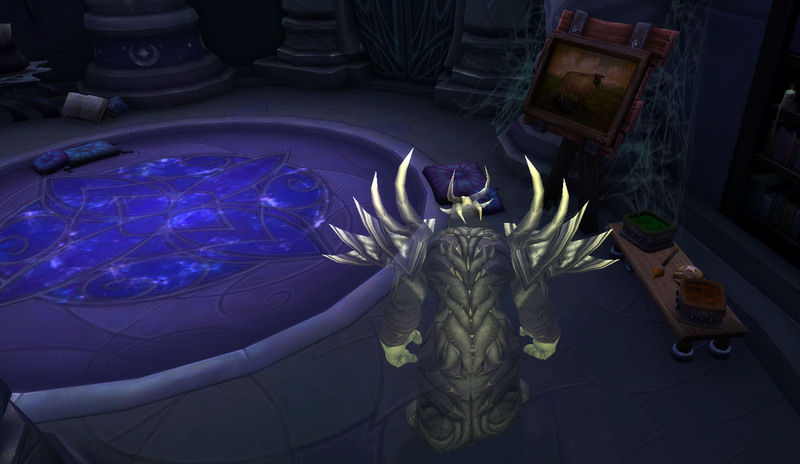 Wait… what private chamber with the hunter’s tame… What secret room OMG OMG how do I not know about this? 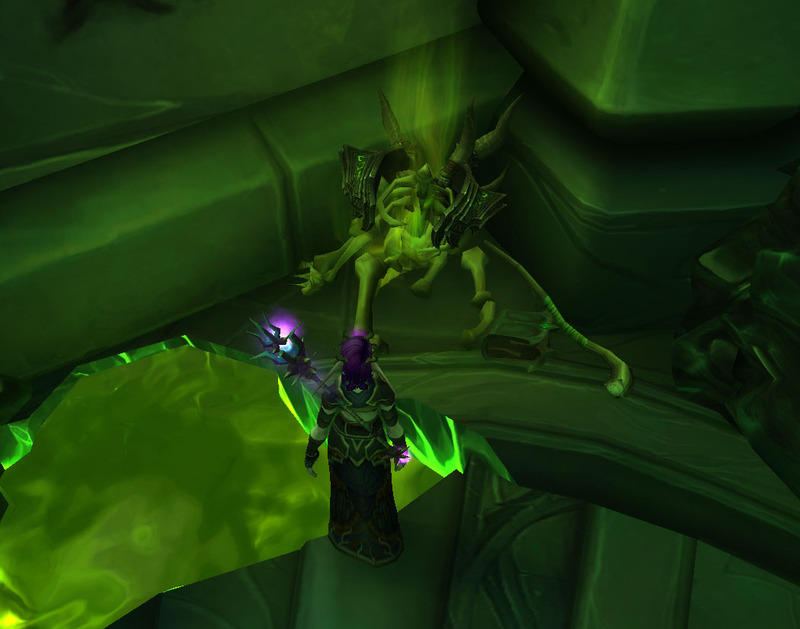 You need the Hybrid Book from getting Concordance in BM, but there’s a fel-touched Hippogryph that’s only accessible with the Love Tap WQ, which opens up Elisande’s personal chambers.